In the Comcast-Disney battle, is Brian Roberts outflanking Bob Iger? 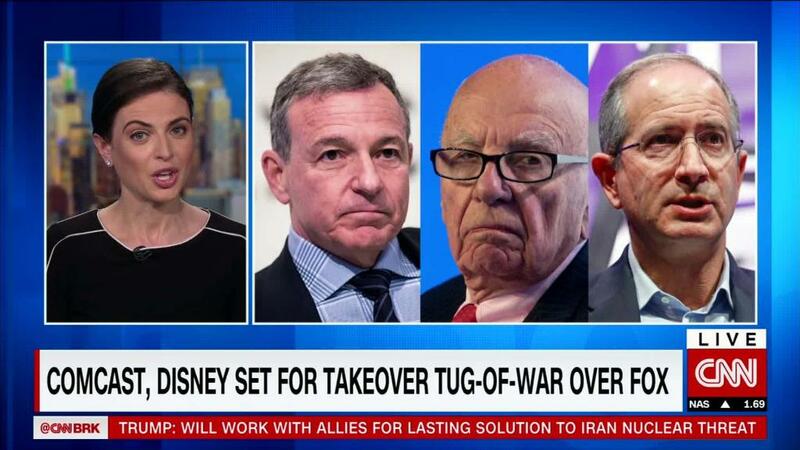 War of the media moguls: Is Comcast's Brian Roberts outflanking Disney's Bob Iger? Bob vs Brian: Which boss will win? Three of the world's most influential media executives are trying to outduel one another for a chance to define the future of the media industry. Where Comcast (CMCSA) and Disney's (DIS) battle for Fox ends up is anybody's guess. Here's where things stand right now: Comcast this week said it is mulling an offer for the major film and TV assets owned by 21st Century Fox (FOXA). The bid isn't yet official. But if Comcast forges ahead, it could threaten the $52.4 billion deal that Disney already reached for the same Fox properties months ago. Comcast CEO Brian Roberts and Disney CEO Bob Iger both see Fox as a kingmaker that could help them beat back Netflix (NFLX). Building scale is a survival tactic for these legacy media companies, which need to find ways to stay relevant as American consumers cut their cable subscriptions and spend more time online. This fight also has a personal twist that makes the outcome harder to predict: Roberts and Iger are bitter enemies, dating back more than a decade when Comcast attempted a hostile takeover of Disney. On the other side of the potential bidding war is Rupert Murdoch, one of the most consequential media executives in history. He'll keep Fox News and a few other properties at the end of all this, but the fact that he's willing to sell anything shows how much the media landscape has changed in recent years. Disney locked in its bid in December 2017 for Fox's movie studio and regional sports networks, as well as cable channels FX and National Geographic. It wasn't the only media titan to show interest. Comcast, the cable operator that also owns NBCUniversal, was also in talks to buy the same Fox assets. Disney won the deal in part because Fox wasn't sure Comcast's bid would win approval from government regulators. There was plenty of reason to worry. Just weeks before Fox accepted the Disney bid, the Justice Department sued to block another media takeover, AT&T's attempt to buy CNN parent company Time Warner. The US government claims the AT&T-Time Warner deal violates antitrust laws because AT&T could "use its control of Time Warner's popular programming as a weapon to harm competition." Comcast, like AT&T, is a content distributor. Comcast turned its attention to another potential Disney takeover target: the European broadcaster Sky. Sky is attractive to both media companies because of its international reach. Sky operates pay-TV services in the United Kingdom and other regional markets, including Germany and Italy, so it could hand Disney or Comcast a bigger global footprint. Iger, who once called Sky "a real crown jewel," has been trying to acquire the broadcaster through Fox, which owns 39% of Sky. Fox struck a deal for the rest of Sky in late 2016, though that deal has been held up in court. Fox agreed to sell any Sky stake it winds up with to Disney as part of the larger deal. Comcast, though, is intent on buying Sky for itself. Last month, it formalized its own bid for a majority stake in Sky as a challenge to Fox and Disney. And Comcast recently got a nod from the UK government that its offer likely won't face any regulatory hurdles. That drama led to the fight that has been unfolding over the last couple of weeks. News broke in early May that Comcast was thinking about gatecrashing Disney's bid with an all-cash package worth more than Disney's stock offer. Comcast's public acknowledgment of its potential bid couldn't have come at a more critical time. Disney and Fox shareholders are soon expected to vote on their deal. According to a source familiar with Comcast's thinking, Wednesday's statement is meant to remind Fox shareholders not to rush into a deal with Disney, since they could be leaving something more valuable on the table. Even so, the latest development is not a tangible offer — something Disney allies are quick to point out. A source familiar with Disney's thinking told CNNMoney that it is surprised at how seriously Comcast's moves are being considered, when it hasn't even offered up any cash yet. From Comcast's perspective, a real offer probably won't come before a federal judge is expected to rule on the AT&T-Time Warner case. The decision is expected by June 12. If the companies win their fight with the government, that could relieve the antitrust concerns that Fox shareholders expressed last year. Regardless of how the AT&T-Time Warner case plays out, both Comcast and Disney could still face scrutiny from regulators over a Fox acquisition. A strengthened Comcast that owns a bunch of Fox networks along with NBCUniversal could concern antitrust officials, said Mary Ann Halford, a former Fox executive who now works as an adviser at OC&C Strategy Consultants. "It's going to be so sizable, and it will give them incredible negotiating power with the other pay TV operators," she said. "And who's to say Comcast doesn't work out favorable terms for them?" A Disney-Fox company, meanwhile, would dominate the box office, since the former would add franchises like X-Men and Avatar to an already stacked lineup of Marvel and Star Wars films. "Just think about how much talent will wind up having to be locked up into all those film franchises," Halford added. If Comcast does make an offer, Disney could counter, kicking off a bidding war for Fox. "We believe Disney CEO Bob Iger has never backed away from making the right long-term strategic moves for his company because of the price," analysts at MoffettNathanson wrote in a research note Wednesday. If Disney matched the Comcast bid with cash, that could mean forking over an additional $10.4 billion, the analysts added. "That seems like a small price to pay for getting this deal done," the note says. Murdoch and Fox have so far favored a Disney deal. But others have suggested that Comcast might be able to sweeten its offer enough to change minds. "We believe it would be nonsensical for the Murdochs and Fox shareholders to choose Disney equity over a superior cash offer," BTIG Research analyst Rich Greenfield wrote in a blog post earlier this month. "Why own Disney when you could buy any stock you want with cash?"